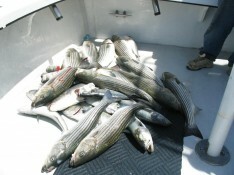 Free Fishing Reports > Northeast > Rhode Island > Block Island > Bass & Blues @ North End B.I. Bass & Blues @ North End B.I. Bluefish showed up pretty good at the North End of Block Island along with the Striped Bass on Thursday June 2nd, just before the change of tide and the wind started howling up to 35 kts. out of the NW. Had the Mike Benoit crew with me trolling for bass and blues and they caught their limit of bass up to 22 lbs. and 13 bluefish that “Rock” was going to put into the smoker. All fish were trolled up with umbrella frames with tubes and shads. The fish were all stuffed with sand eels, and spitting them out all over the deck. Posted by: L'il Toot Charters Inc.
L'il Toot is a 35' custom sportfishermen. Capacity is 6 anglers max. We fish for cod, blues,striped bass, fluke, black sea bass, scup (porgies), blackfish (tautog), bonito, tuna, shark, mahi-mahi. 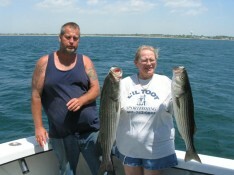 Inshore and Offshore fishing, with 1/2 day, 3/4 day, and full day trips available. All tackle and bait is provided.